The hardy Begonias are finally blooming. Walking around the garden this morning the first few lines of Karl Niebuhr’s Serenity Prayer came to mind. It is the first time in a few days I’ve had time to simply wander around, camera in hand, and I had been wondering what I would find. 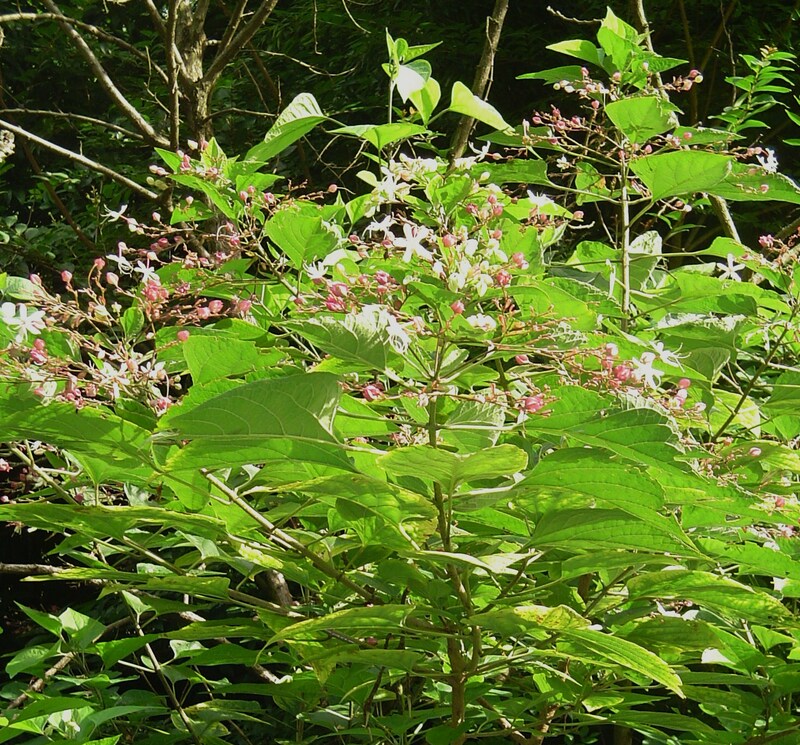 The Butterfly Tree is almost finished blooming, and is now forming seeds. 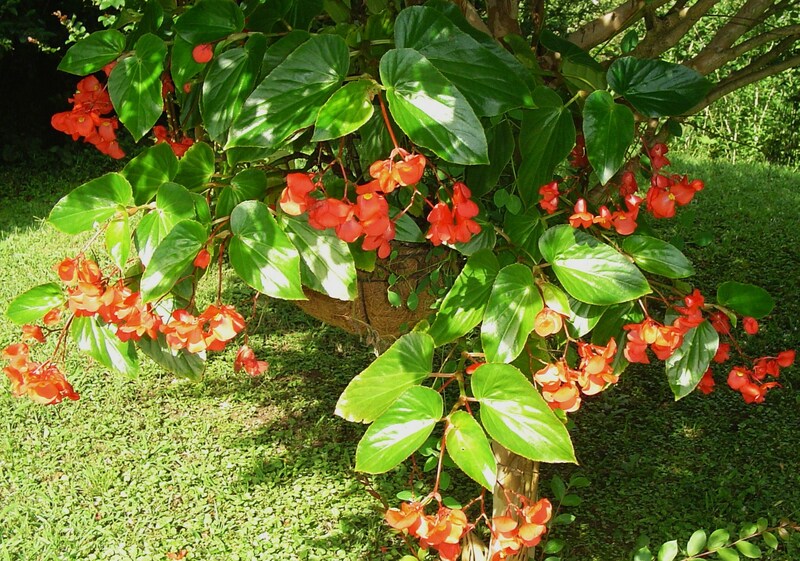 When the seedpods open, they will be bright blue, and as beautiful as the flowers. The garden is never the same, even one day to the next. What is blooming today may be gone to seed in another day, or may be gone- into the stomach of a hungry deer. I was amazed to find deer droppings all around the garden, and evidence of their ripping and chewing on so many shrubs and perennials. All of our efforts to fence them out and repel them for naught; much of the conventional wisdom of plants the deer will ignore proven wrong. It has been a good growing season as we’ve had no drought. The rain has been consistent and abundant. The new ferns have gotten off to a good start in this moist summer. It has been a difficult season for all those summer plants which need days and days of sunshine and heat to produce well. Geraniums, tomatoes, basil, squash, lavender…. So many plants are either sulking with very little new growth, or have just molded and dissolved. The cool, overcast and wet weather has put a damper on things. Not a single daisy has broken bud yet, though they are sitting there at the ends of lush green branches. Perhaps in September they will give a glorious show. On the other hand, some plants have grown so much that pathways are nearly closed off by their luxuriant growth. Roses and Rose of Sharon reach out to join hands across the path. 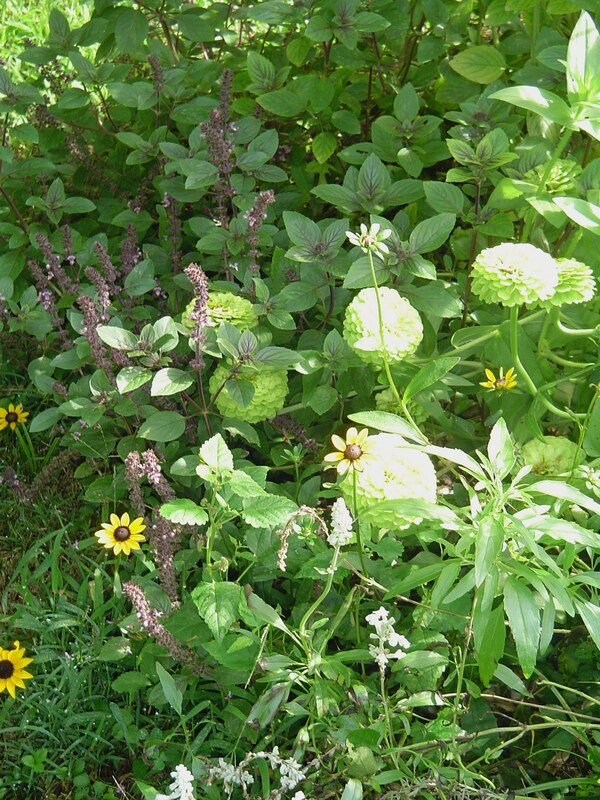 Echinacea and Monarda, fallen over from their own weight, spill into the walkway. 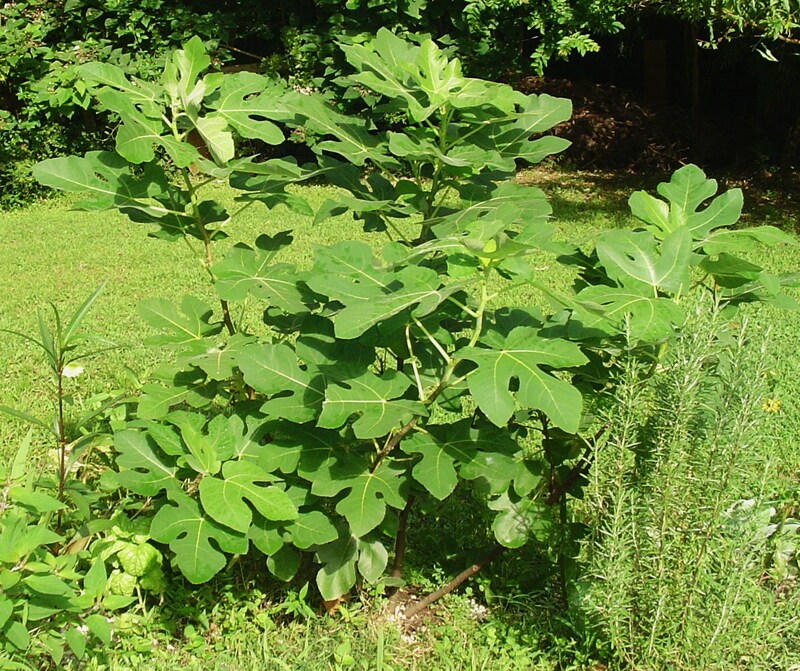 Our new fig has quadrupled in size since it went into the ground last autumn. This fig came home in a 1 gallon pot last summer. Nature will surprise me. Every day. It is up to me to get up, suit up, get outside, and see what is there with fresh eyes. 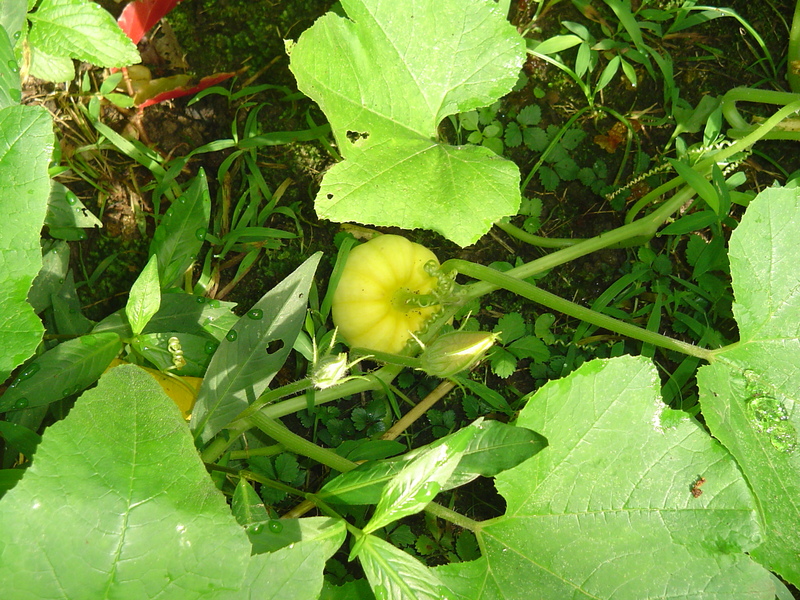 A “surprise”, volunteer vine, growing in the shade, is making a surprise squash. The wild things and I share this garden. 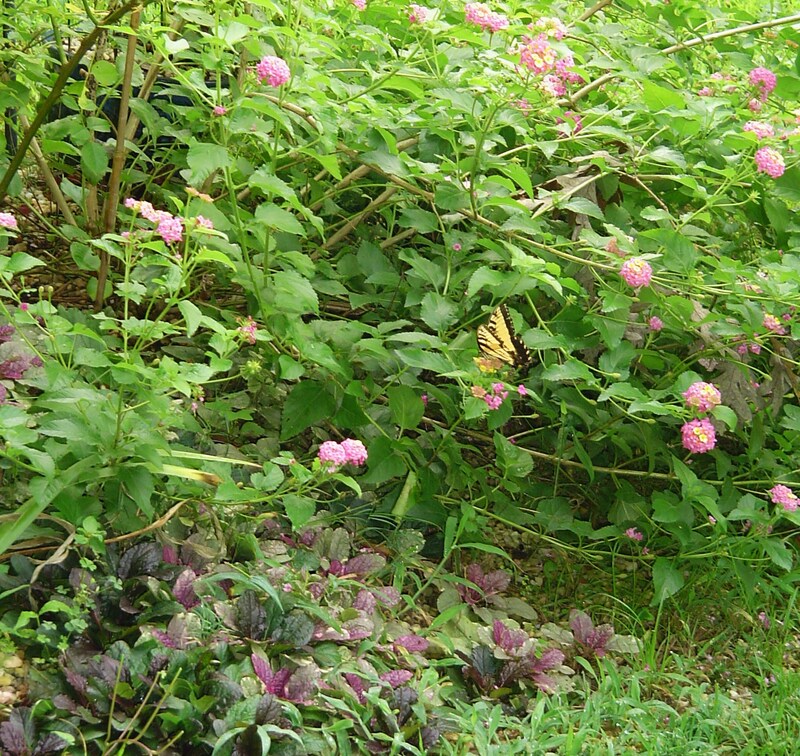 It is teeming with birds, lizards, frogs, butterflies, squirrels, dragonflies and bees. It will also always be home to mosquitoes, chiggers, deer, bats, voles, and other furry things which visit only under cover of darkness. I will never completely eliminate the deer, or the biting bugs, and will stop expecting to be successful in doing so. This will always be a wild forest garden. I have given up any illusion of taming it into neatness or manicured tameness. The plants will do what they will do, and my efforts or expectations have very little impact. Sun and shade, wet and drought are completely unpredictable. Shade becomes full sun when a tree falls. 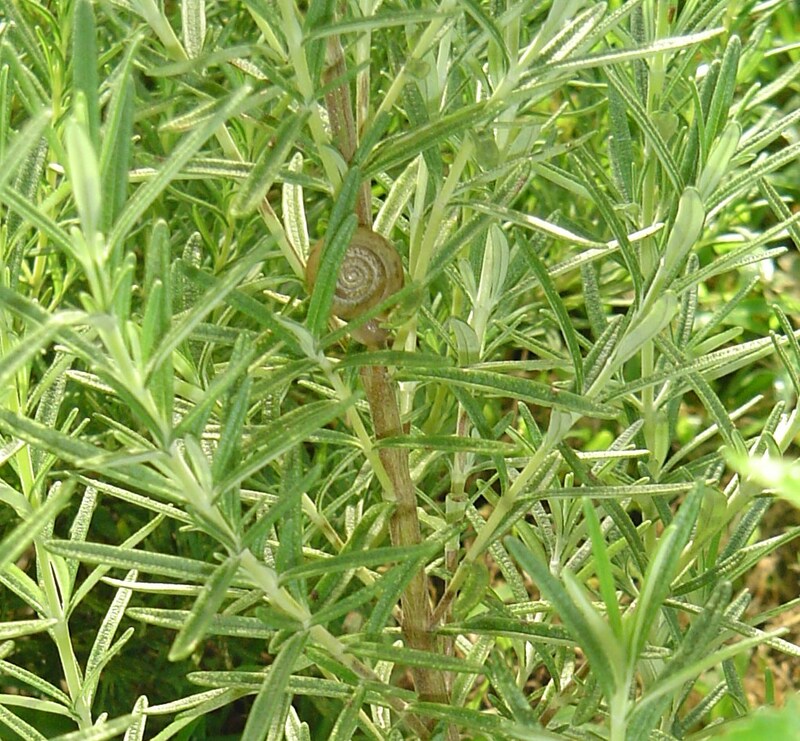 Sun becomes shade when a shrub grows beyond its expected size. Rain will come when it comes, and often too much at once. 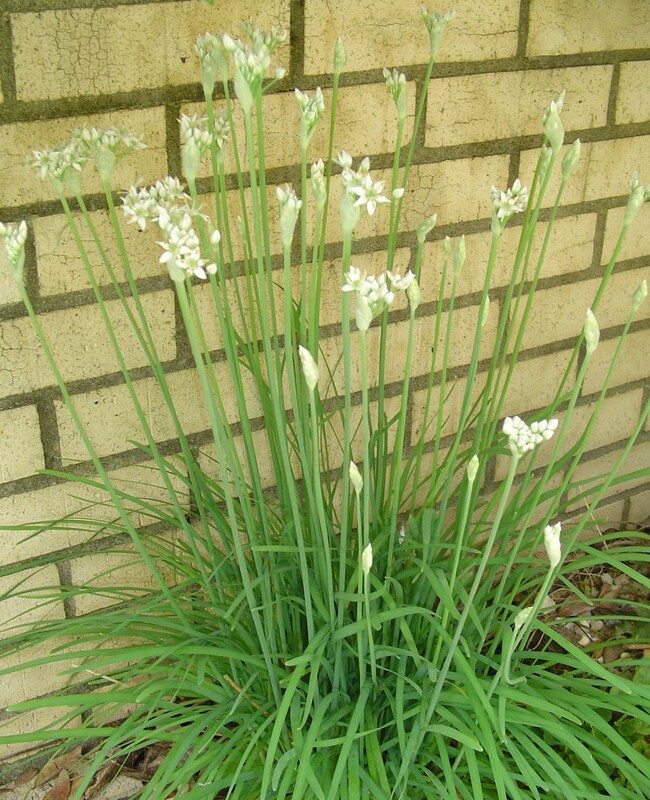 Garlic chives, now shaded, still bloom. Gardening magazines and nursery catalogs are full of plants I can’t grow and techniques which won’t work here. I will simply erase the Parrot Tulips and Toad Lilies from my mind and plant the few reliable plants I have learned to count on. Purchasing new plants is enjoyable, but too often counterproductive; when they soon get eaten, drowned, or burned by the sun. 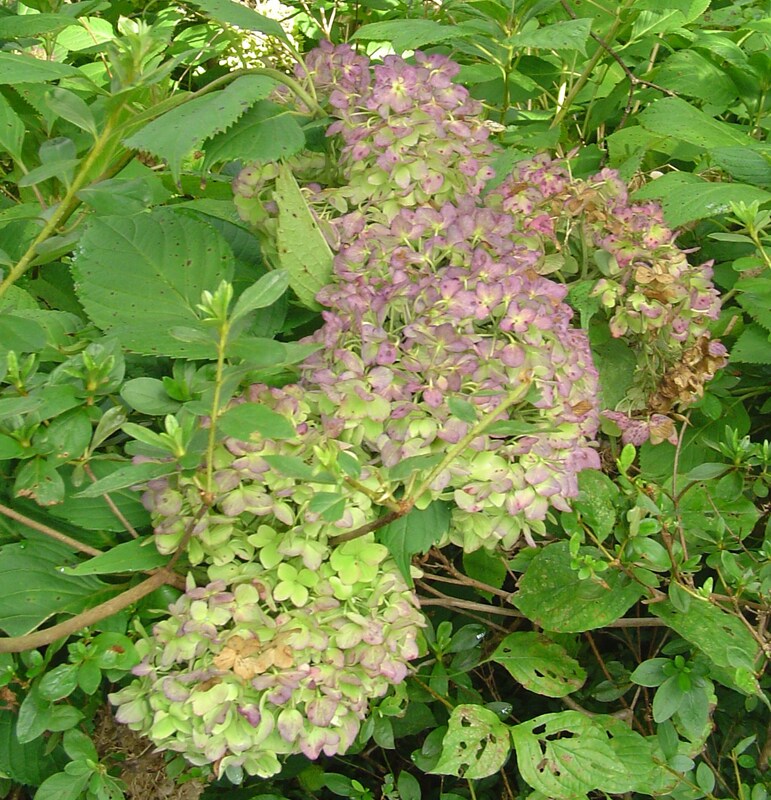 This hydrangea has been grazed by the deer more than once, even in this protected area in a pot. Record the triumphs in photos. If a rose blooms today and is eaten tonight, at least I can enjoy it in the photo. Looking back at photos from other years, I can see how much growth and progress has been made since the beginning. It is encouraging to have a photo record of successes and beautiful moments. 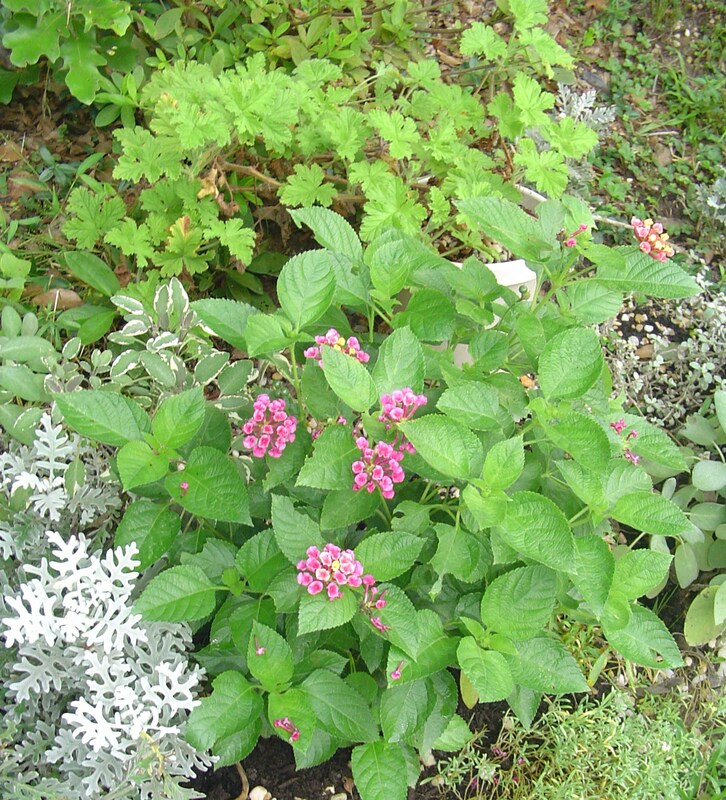 Buy gravel and compost on every trip to the garden center. A new hole will always need to be filled, and the beds need regular gifts of compost. 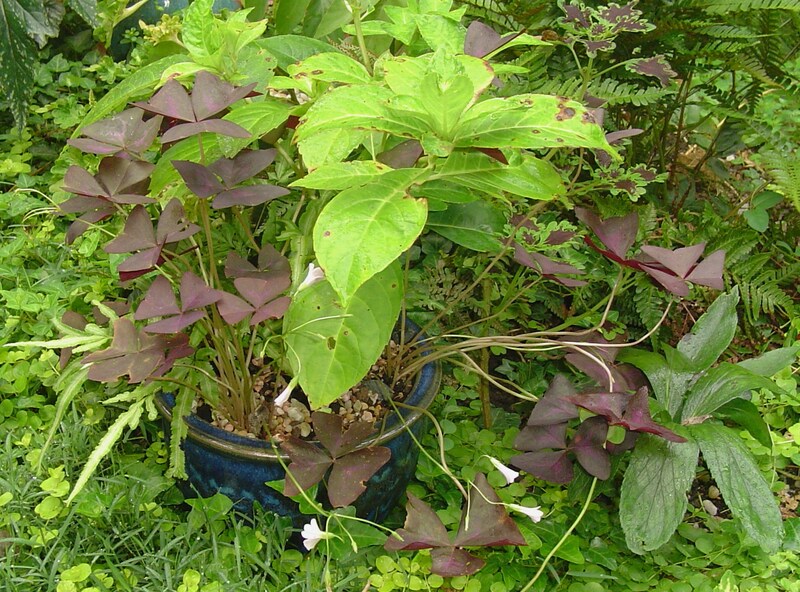 A bag of compost must be purchased along with every new purchase of plants. Any plant worth planting is worth caring for. Never give up or lose hope for more beauty to follow tomorrow. 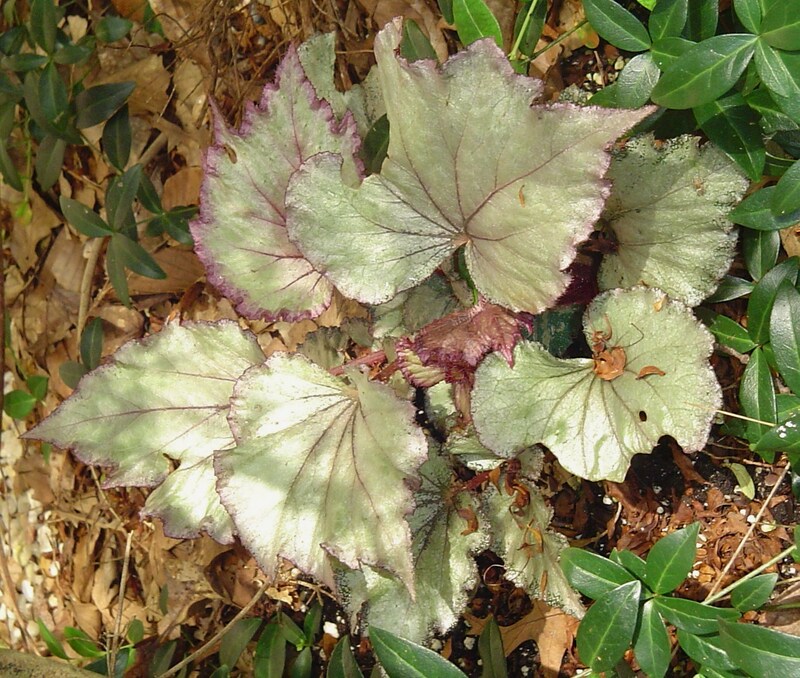 After months of trying to overwinter and save a Rex Begonia, I finally gave the sad empty pot of soil to the Earth to fill a hole near the foundation of the house. 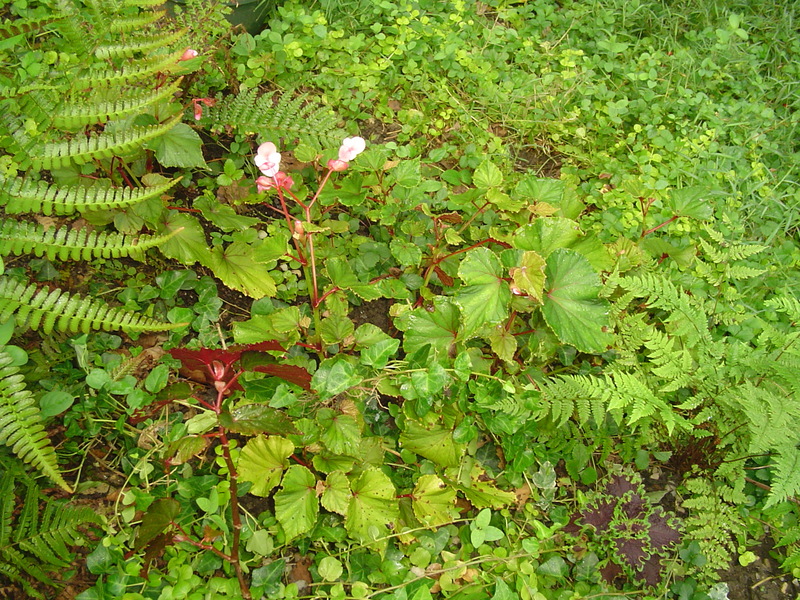 And today, miraculously, I found the Begonia growing again, under a shrub, just as beautiful as it ever was last summer. This garden is full of surprises. 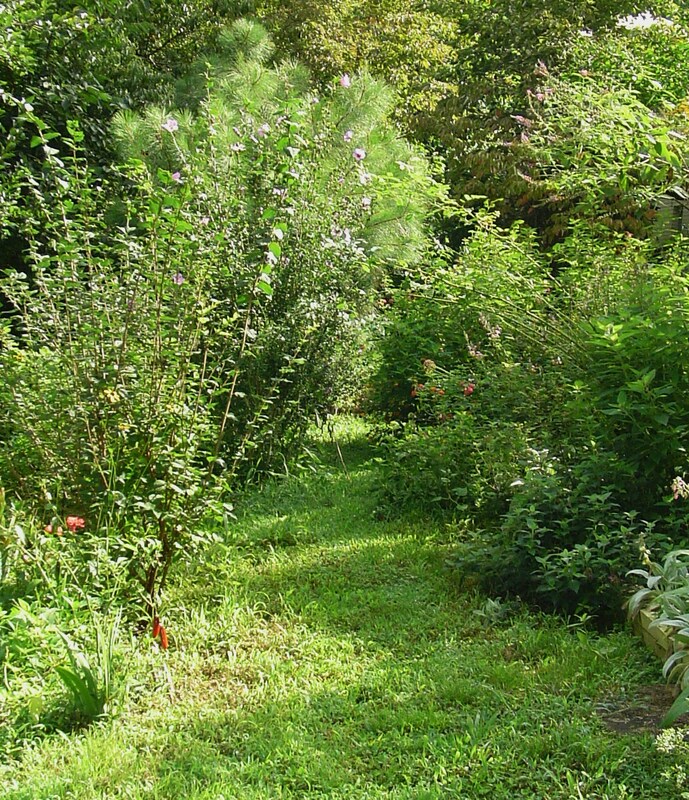 So long as my eye settles on the beauty and wonder of it all, this forest garden is full of joy and possibility. 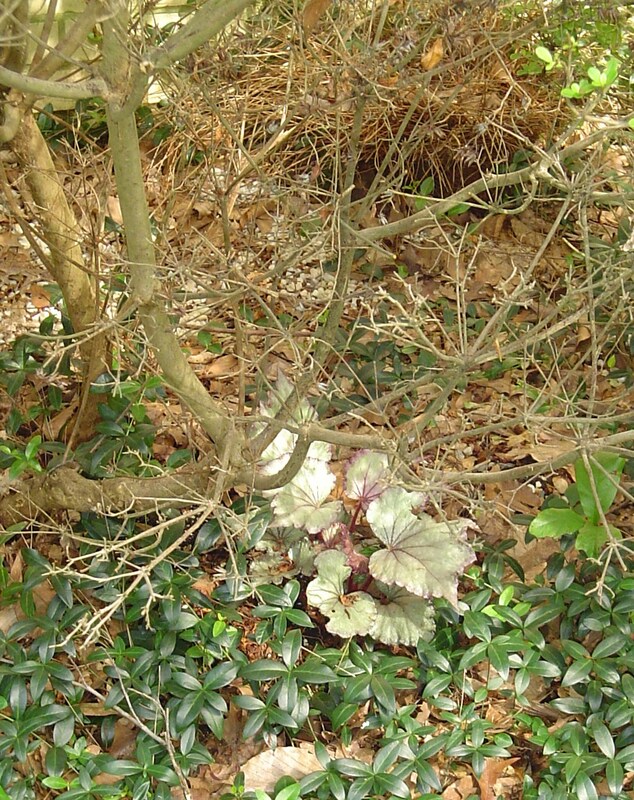 Begonia Rex, given up for dead, is alive and well in this forest garden. this is such a beautiful spiritual post. Most uplifting. Loved this. Thank you- so glad you liked it.